Direct Oceanfront Resort Living at #5-202! Coastline ocean views. The best views in the complex! Welcome to direct oceanfront living at #5-202! Direct Ocean Views from Master Bedroom! 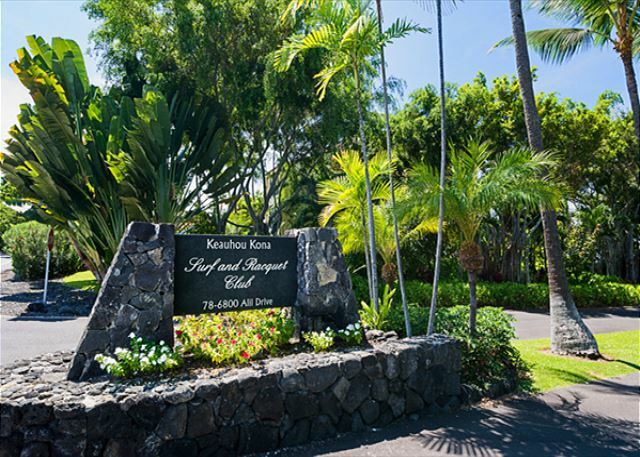 Welcome to the gated Keauhou Kona Surf & Racquet! BRAND NEW VACATION RENTAL WITH BRAND NEW OWNERSHIP! 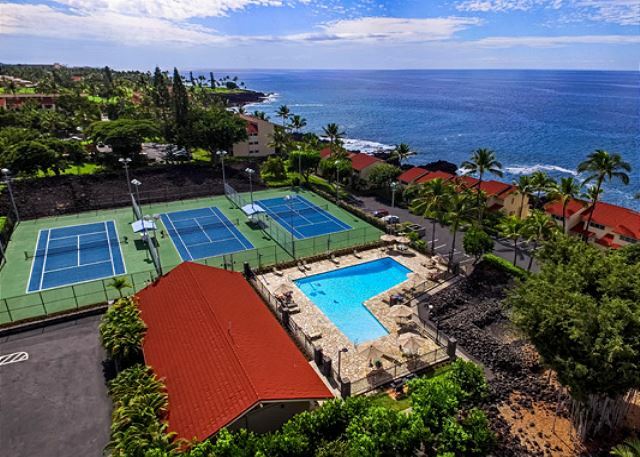 Welcome to #5-202 at the Keauhou Kona Surf & Racquet Club! The new owners are excited to have their new property that's never been rented before be placed as a new Vacation Rental! DIRECT OCEANFRONT RESORT LIVING AT IT'S FINEST! 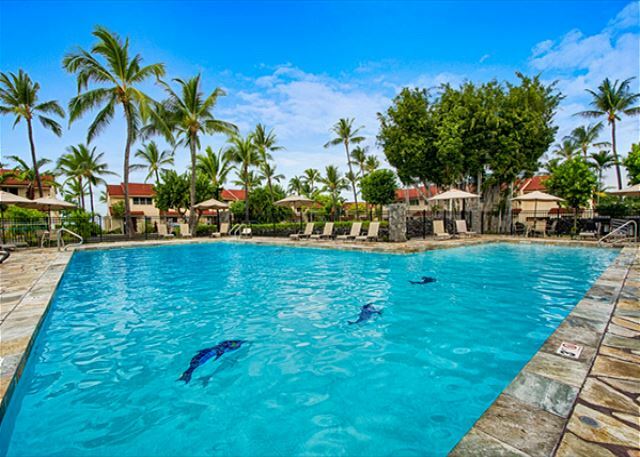 #5-202 at the Keauhou Kona Surf & Racquet Club has 2 bedrooms & 2 baths. It's located on the highly desirable 2nd floor in the most sought after building 5. This is the only building that has ocean in the front and golf course in the rear. Ocean & coastline views all the way to Kailua Town where you can see the cruise ships in the Bay. Sunsets year round, whale watching in season & dolphin watching, cool ocean & mountain breezes & a golf course views from the guest bedroom with 2 twin beds. The Master bedroom has a King sized bed that has direct oceanfront views. Spacious 1,170 sq. ft. & a kitchen that opens to a great room with ample room for dining and living space. There is a 245 sq. ft. covered oceanfront lanai that provides room for a table & chairs for oceanfront dining if you wanted! 2 chaise lounges included! BEACH GEAR INCLUDED WITH PROPERTY! Snorkel gear, beach chairs, boogie boards & beach umbrella!! 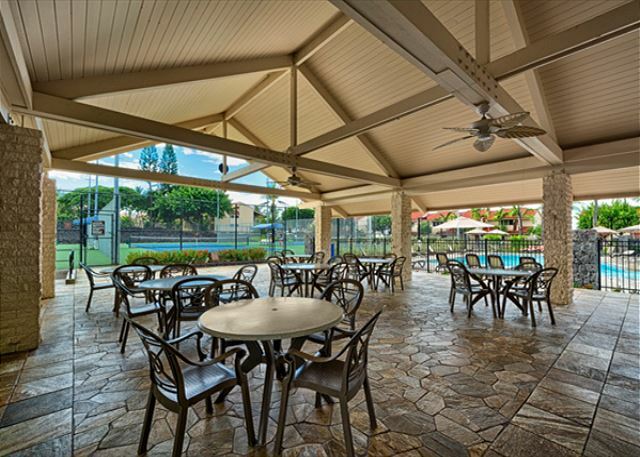 This gated community offers many amenities including a large newly remodeled pool, 3 lighted tennis courts, a volleyball court and several barbeques situated around the complex. 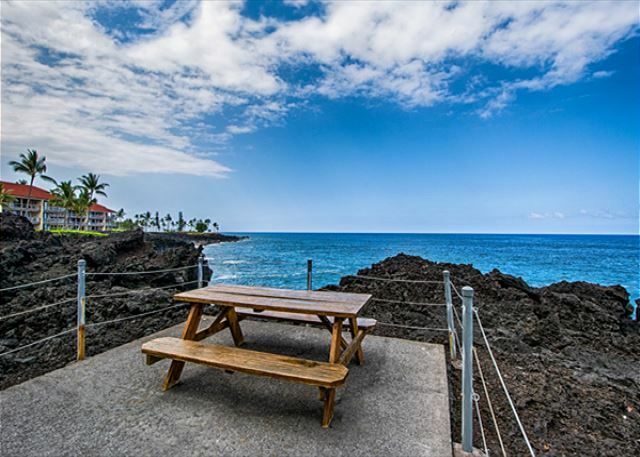 On the north side of the property is an adjacent beach & is also within a short walking distance to Kahaluu Snorkeling Beach Park, better known as Turtle Beach, with world class snorkeling & a breakwater for calm seas. You can also walk to the Keauhou Shopping Center with KTA Supermarket, Longs Drugs, restaurants, shops and movie theaters. 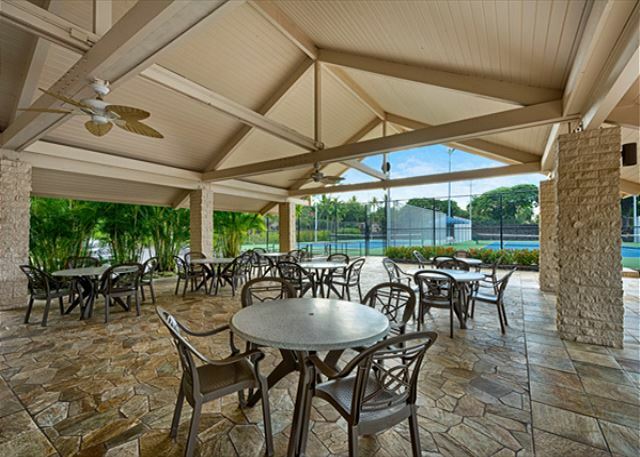 The property is also adjacent to the 18 hole ocean golf course of the Kona Country Club, recently renovated to accommodate professional tournaments. Perfect location - fabulous property! Unit 202 in building 5 is THE perfect place! 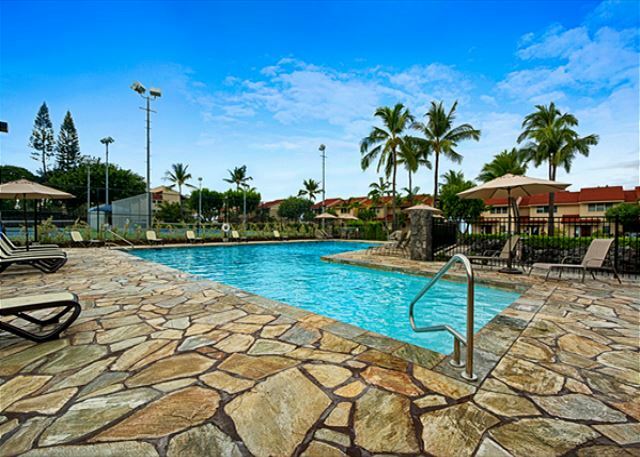 The location was about 5 minutes south of the Kona Center making the shops, restaurants and nightlife easily accessible while also allowing a quiet retreat. The condo was in great condition with all the amenities we needed to pack picnics and entertain family on the balcony. It was a dream to go to sleep and wake-up so close to the water. I would love to return to this amazing oasis! We were very comfortable in the apartment. We're happy to hear that you found your lodging comfortable. Hope to accommodate a vacation for you again soon. Mahalo!! a guest from Swarthmore, PA does not recommend this vacation rental. We had a great time in Kona. The building was very nice and quiet and the view was breathtaking. The unit was nice and clean unfortunately two things about the condo was very disappointing. The photo of the balcony shows a nice table and chairs but that’s not what is on the balcony. What is on the balcony is an uncomfortable high top table and the king size bed was very very uncomfortable. Over all we did have a nice stay. Great Views, well appointed condo. Management company was very proactive in assuring our stay was perfect and our needs met. WiFi was having issues and needs to be updated. We thoroughly enjoyed our stay in Hawaii. The location of the condo was fabulous. Close to family dining and fine. You are literally a stones throw from the water!! There is this amazing splash that happens right in front of you. We spent so much time out on the balcony. Full kitchen! No AC but honestly the winds cool you down. Only issue we had was some bugs in the kitchen , house keepers also didn’t do best job prior to arrival. I believe Inwoukd stay again. I like condos , wife likes resorts. Value of this place was amazing! I do k ow that there some people I know that could not stay here because of bugs but it’s Hawaii they probably couldn’t go at all. 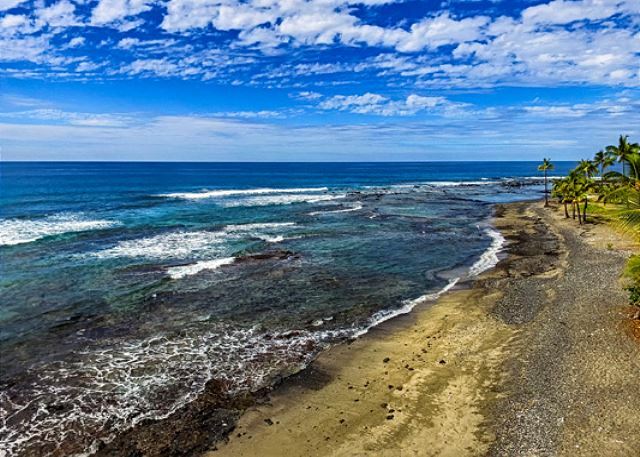 Wonderful ocean view and great location. The kitchen was well-equipped and we appreciated the chairs and snorkel gear. Great location -- quiet, and so close to the ocean, which was amazing. Loved hearing the surf at night and also sitting on the balcony watching the waves come in -- terrific spot, and one of the nicest in the whole development since the building is at the far end! Property was clean and well equipped. Appreciated some initial supplies on hand, and also availability of soap, detergent, sponge. Would be useful to provide info on local shops, Safeway, restaurants. Lots nearby but took us a bit to discover it! No directions on site for use of TV or music and could not figure them out -- some guidance would be helpful. Similarly guidance on what to recycle and where useful if one is not from Hawaii. Problems with drains in both bathrooms -- this is something that should be monitored regularly. Towel racks in master bath were loose (one fell off and broke) -- again not a big deal but cosmetic touchups would enhance the place. Primary concern was bugs and occasional cockroach in kitchen -- I know this is Hawaii, but better bug traps and advice on how to manage would be helpful. Just needed to be very attentive to keeping the kitchen clean! Despite these things we had a great vacation and liked the place a lot, and would highly recommend it -- could just use a bit more attention from the owner for guests. Blake from rental company was helpful. Unbelievable view in a beautifully maintained gated complex. We could hardly move ourselves off the was just so wonderful looking out over the ocean. A very comfortable suite...very well equipped with lovely Hawaiian decor. Really enjoyed our stay here. The comlex grounds are like a tropical park..very well kept and clean. Very nice pool also well maintained and clean. Easy to get to the shops in Kona and the Keauhou Shopping Center is literally walking distance and has good restaurants, a grocery store, drugstore, and interesting shops galore. Blake was great to work with. Very much appreciate him taking my call right away when I had questions after we first arrived. Very professional and a seamless rental process. Thanks so much for a great stay! The best part about this condo is the fantastic view from the balcony. It is right on the water and it has a view up the coast. So pretty! Property managers helped with any problems. Having a kitchen was a must. We were happy. We suggested that they install a ceiling fan in the master bedroom for better airflow. The views from this property are second to none. We will only choose to stay in building 5 at this resort from this point forward. We were so happy.